The plat for the Village of Superior was recorded in July 1832. This later became known as Waukazoo on the North side of Black Lake and Central Park on the south side. Macatawa Park on the south side of the channel was platted in 1881 entirely by a group from Holland with lots for summer cottages and plans for a temporary resort hotel facing Lake Macatawa. Construction of the Macatawa Park Hotel began on June 12th 1882, and by July 1st, the hotel was open for business. 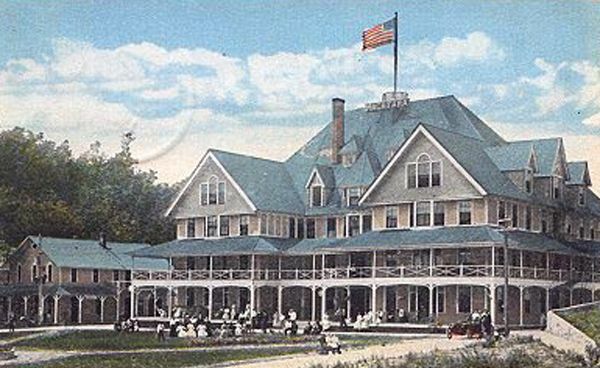 Not to be outdone in scale or grandeur, in 1895, a new and very imposing hotel had been constructed to the north and west of the Macatawa Park Hotel. The new Hotel Macatawa had 64 guest rooms, and, like the Hotel Ottawa, it featured a “ladies’ parlor”. Hotel Macatawa was demolished in 1956 to make room for the Point West Restaurant. This card from 1908 shows the first hotel on site, the Park House Hotel, just to the left of the new hotel, which later became its dining room. Camping in tents, fishing, picnicking, exploring the sand dunes and splashing around in the lakes continued to draw bigger and bigger crowds. 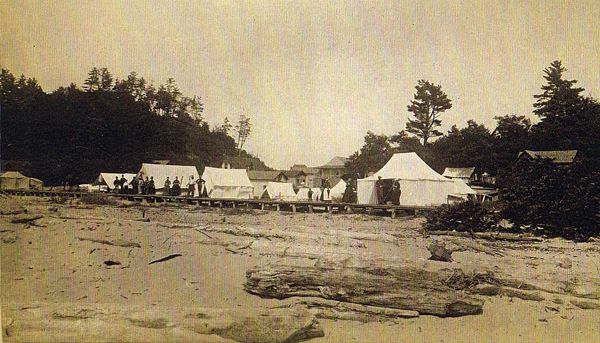 This photo from the Macatawa side shows a row of tents on a wooden walkway. 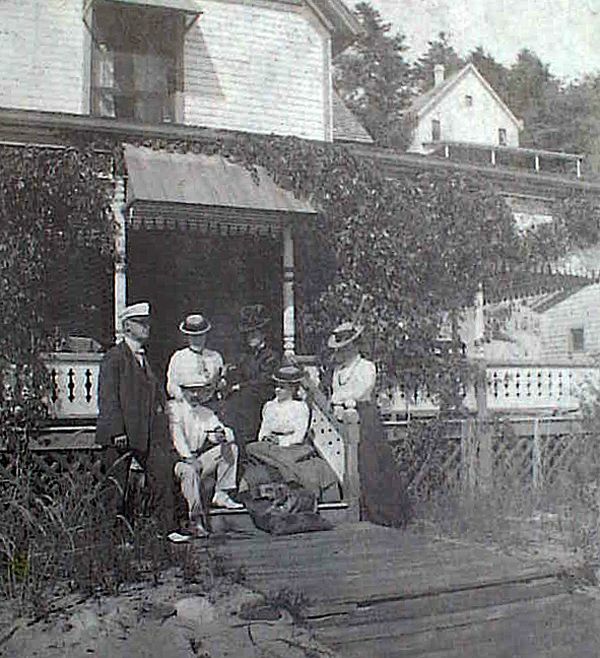 Along with Mr. Bayne and Mr. Barber, shown with his family at their cottage ON Lake Michigan Drive (the lower boardwalk), L.C. Stow of Stow Davis Furniture was a charter member in the yacht club. In June of 1898 the organization had prospered and it was decided to buy some property at Jenison Park on the south side of the lake and build a proper two story club house building. 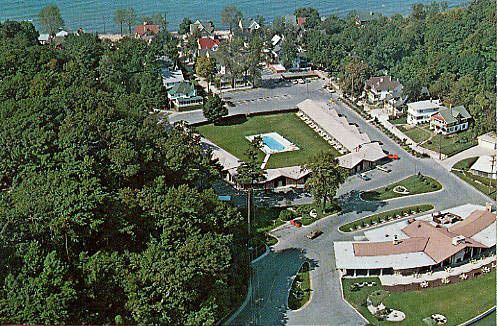 The name was changed to the Macatawa Yacht Club, and later to the Macatawa Bay Yacht Club, the name it uses to this day. Angels Flight took visitors to Macatawa Park to the top of the dune for expansive views. 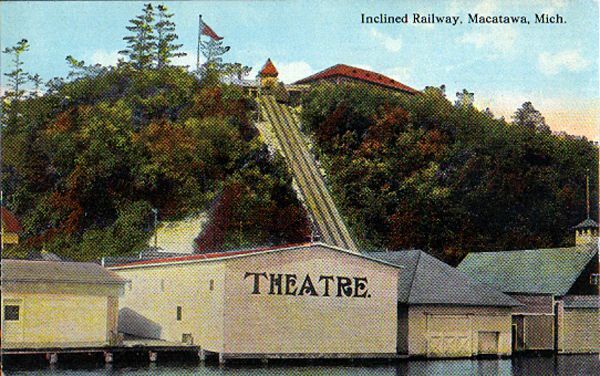 Mr. Arthur Fowle opened Angel’s Flight, a dance pavilion and ice-cream parlor atop Old Baldhead, in August of 1909. It was reached by a short funicular or cog railway. Angels Flight was damaged in the great Macatawa fire of 1922 and never reopened. It was destroyed in another fire in August of 1945. The Pointe West Hotel and Restaurant complex in the 1970‘s The restaurant is in the lower right. Behind it in the center of the photo is the motel surrounding the modest swimming pool. Lake Michigan is at the top in this photo looking roughly West Northwest Hidden in the trees to the left is the multiple story hillside motel annex. 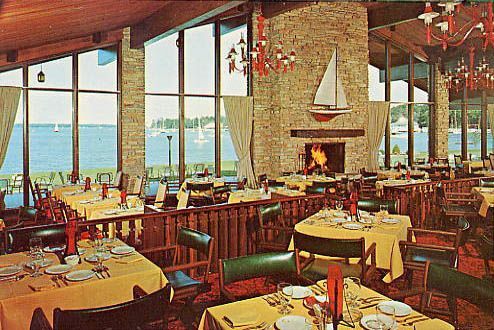 The main dining room gave diners an eastward looking view of Lake Macatawa. The chairs were styled like folding deck chairs.